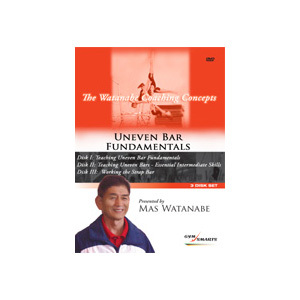 This 3-disk DVD set covers six essential skills to master beginning uneven bars, and form strong basics, common intermediate skills for beginning competitive optional bars, and why using the strap bar is important for developing bar skills. These three DVDs will help gymnasts throughout their athletic careers with strong basics. Disk I: The glide kip, cast to handstand, the clear hip circle, tap swing forward, the three quarter giant, and the flyaway. Disk II: Backward giant swing, straddle back over the low bar, shoot over with ½ twist over the low bar, cast to handstand and pirouette, and the layout flyaway. Disk III: Using the Strap Bar for: the tap swing forward, backward giants, forward giants, clear hip circles, the sole circle forward and backwards, Stalders, Endo Shoots, and the tapping front giant that is used for release moves and dismounts. 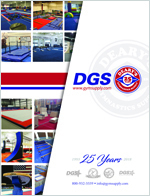 His explanations are clear; and include excellent demonstrations by his hot shots group and level 10 gymnasts. Masayuki Watanabe is world renown in the gymnastics world for his technical expertise of gymnastic movement. For the past 35 years, he has developed many world-class gymnasts, Olympians, national champions, and trains coaches, at all levels and from many countries.